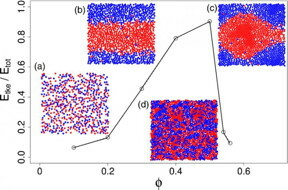 Computer models show how small, spinning particles suspended in a fluid can form a variety of macro-scale structures at different concentrations. (Concentrations increase left to right.) The vertical axis charts kinetic energy, which declines sharply at high concentrations. From flocks of starlings to schools of fish, nature is full of intricate dynamics that emerge from the collective behavior of individuals. In recent years, interest has grown in trying to capture similar dynamics to make self-assembling materials from so-called "active matter." The research, published recently in Physical Review Letters, could help engineers to understand the dynamics of these systems and design new materials using rotating colloidal particles.